Over 20 Romanian designers will be present between April 25 and April 26 in Bucharest, at the tenth edition of Designer’s Drive-in pop-up shop. The list of designers includes: ACBC, Adelina Ivan, Affectif, Anastasia Orlov, Atinge Organic , Atu Body Couture, Carla Szabo, Claudia Castrase, Crepe Black Collar, Cristian Samfira, Fandacsia, Irina Marinescu, Lady Magpie, Lana Dumitru, Le Petit Indigent, Luviane Atelier de Parfumerie, Madeleine Artisan Jeweler, NN Cosmetics, NOON, Pam Pam Project, Patzaikin, Roxana Davidescu, Stereo Socks, Undress and Wild Olive. 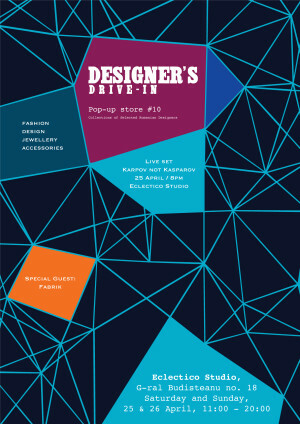 Special guest of Designer’s Drive-in #10 = Fabrik. Saturday, April 25, 20.00, Karpov not Kasparov live set. "Designer’s Drive-in #10 " Fair in Bucharest. You can get here description, reviews, address, time and details of "Designer’s Drive-in #10 " Fair in Bucharest. Visit Bucharest Tips for more Fair events in Bucharest!